• At-home fans will eat about 1.33 billion chicken wings on Super Bowl Sunday. • Before 1991, marching bands usually performed Super Bowl halftime shows. The New Kids on the Block was the first pop act. • The Super Bowl trophy is made by Tiffany & Co. and cost $25,000. • 72 game balls are used during the Super Bowl (and we don’t want to hear about Deflategate anymore!). • Gamblers wagered a record $132.5 million on Super Bowl 50. Thanks to Forbes and USA Today for providing these interesting Super Bowl facts! So, that brings us to needlepoint…. “Huh? It does? What does needlepoint have to do with football,” you ask. Absolutely nothing….Well, unless you like to needlepoint while watching football. (Yes, that’s a thing). But, for those of you who aren’t into needlepoint stitching parties, you can still enjoy wearing a hand-stitched needlepoint football belt. It’s the perfect accessory for football fans, even in the off-season. Brewster Belt Company‘s needlepoint belts are totally customizable. Change the colors to match your favorite football team’s colors or work with our designers to create your own custom football design from scratch. You can also select a silver or brass belt buckle, as well as the the leather color. 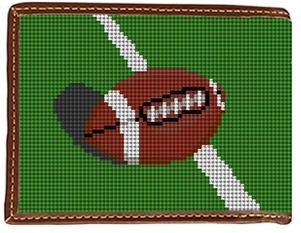 Brewster also makes custom needlepoint football wallets, flasks, key fobs, dog collars and more. They make great gifts for football fans. If you’re a betting man, a custom football needlepoint wallet can house your winnings. Customize it with your team’s favorite colors or work with Brewster’s designers to create your own custom football wallet design. Browse all of the sports-themed wallets on the site for ideas, if you need a little inspiration. Add a three-initial monogram to add extra personalization. 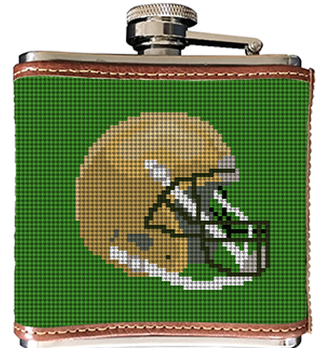 For tailgating, a custom needlepoint football flask will show your friends you mean business. They’re totally customizable and make a great gift for football fans, groomsmen, fathers, brothers and anyone who likes to bring a good time along with them. Change the color of the helmet, add graphics, numbers or a monogram for the ultimate personalization. If you want to be able to jump on any bandwagon, show your lack of commitment…uhem…your love for the sport with a good old basic football needlepoint belt. If you’re a college football fan, you might consider sporting a college campus needlepoint belt featuring your favorite college football team’s stadium and other campus buildings. College campus belts are available for any college! Not much left to say other than: Go, team…and don’t get buffalo sauce on the couch. Next Next post: Valentine’s Day: Are you a lover or a hater?